Click here to read a primer on our shirsey rankings. Click here to read the Orioles BP Top 10 Prospects. Christ, Chen, Pie, and Sosa write-ups are courtesy of OUR GOOD FRIEND FROM HIGH SCHOOL ROBBIE SHORR. You can find him nowhere. He is a nice guy. You would probably like him too. What Happened to the Player in 2013: Everything. After a torrid start to the season, Davis took some time off because he died for our sins. 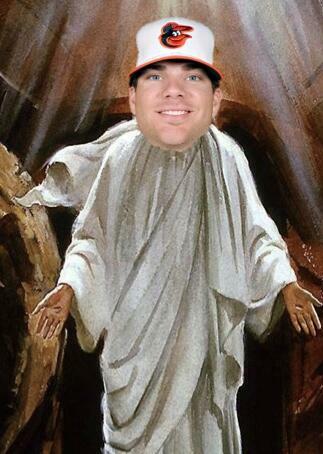 When he eventually rose, Davis continued to hit balls far, breaking the Orioles single-season home run record. Strengths: Contains a superhero reference. Is purple and green. Weaknesses: Is purple and green. Doesn’t really help quiet steroid rumors. (I assume that whatever radioactive stuff gave Hulk his powers is a banned PED). Overall Future Potential: 6; if you wear this at a bar, you’ll probably get a few high fives. Realistic Role: 5; it’s highly unlikely Davis hits as many bombs as last year. Risk Factor/Injury History: High; comes with all of the questions that any power-hitting shirsey faces in baseball today. What Happened to the Player in 2013: Melvin Mora spent most of his time at home taking care of his sextuplets. Strengths: Like Mora, this shirt can play multiple positions. An extra large has the ability to clothe six children at the same damn time. Elite price. Weaknesses: If you fear the devil, stay away from this shirsey. It features four different six grade tools and the number six on the back. Mora also has sextuplets. So yeah, beware. Also could be mistaken as a football coach shirsey. Risk Factor/Injury History: Low; price eliminates any semblance of risk. The Year Ahead: The sextuplets will turn 12, seriously strengthening Fallston, Maryland’s Little League All Star Team’s entire infield. THE MORAS ARE EVERYWHERE. What Happened to the Player in 2013: Koji became the darling of the baseball universe as his splitter and loving smile helped him catapult the Red Sox to the World Series Title. Also tons of #JizzFace. Strengths: Orioles fans have fond memories of Koji Mudbone as he turned into #CHRISTDAVIS. Splitter. Control. Happy face. Also #JizzFace. Weaknesses: Not available for purchase. Overall Future Potential: 6; high back end of the wardrobe closer. Lets you do bedtime in style. Realistic Role: 5; decent bed time shirt. You’ll be cozy, but will you be comfy too? The Year Ahead: He’ll keep splitting baseballs and making people look stupid on 87 MPH fastballs because Koji. What Happened to the Player in 2013: After a promising first year in the majors, Chen was quite average in 2013. He spent a large chunk of the season on the DL, which many people attribute to trouble becoming accustomed to a major league workload. He also might have had the biggest jump in Batting Average Against his third time through the order of any pitcher ever. Despite these two obstacles, Chen still led the 2013 Orioles in innings pitched. (I made that up, but admit it, you believed me). Strengths: This Shirsey screams “I’m multicultural!” and also Mandarin looks cool. It’s a great conversation starter if you like debating about whether Chen’s birthplace should be called “Taiwan” or “Chinese Taipei.” And with this shirsey, it has never been easier to show your support for Taiwan/Chinese Taipei in the Little League World Series. Weaknesses: This shirsey is not available for sale. Anywhere. Which might actually be a good thing, because if you owned it, someone would eventually ask you what language it’s in, and you would have no idea because you think all Asian languages are the same. Overall Future Potential: High 6; four great tools make this shirsey a must-have for any Chen fan. Realistic Role: 6; you just don’t know how this shirsey will hold up under the wear and tear of a full American shirsey season. Risk Factor/Injury History: This shirsey does have one serious question mark: How do we know that actually means “Orioles” in Mandarin? The Year Ahead: Chen might have to compete with a similar Tsuyoshi Wada shirsey in the near future. What Happened to the Player in 2013: He signed a contract with the Long Island Ducks, but never showed up because he’s Vlad Guerrero and he can do what he wants. In September he announced his retirement from the game of baseball effectively cementing his legacy as one of the most freaking awesome players ever. Strengths: Shirsey will help you chase various things such as, but not limited to; cats, attractive people of the opposite gender, your deaf friend Kenneth, fantastic deals at the mall, tail. Weaknesses: “Vlad was on the Orioles?” your deaf friend Kenneth will say. This is bad because you’ll remember that the 2011 Orioles needed to bat Vlad fourth the entire season for no reason. The Year Ahead: Vlad will continue single-handedly revitalizing his hometown community with the various economic opportunities he’s provided through his various business ventures; a concrete-block factory, a propane distribution company, a supermarket, a livestock and vegetable farm, and a women’s clothing store. What Happened to the Player in 2013: He played with the Doosan Bears of the Korean League, which consequentially tore him to shreds. That’s what happens when you get too comfortable with a bear. Strengths: Plus derp and plus-plus player obscurity highlight this jersey’s lack of relevance in today’s baseball landscape, which is perfect if you are a loser looking for street cred in all the wrong places. Weaknesses: No one remembers Garret Olson. Judging by the background of the photo, this shirt probably smells exceptionally odd. Overall Future Potential: 5; if the smell comes off in the wash, you could wear this puppy to the gym. Realistic Role: 4; the smell won’t come off, relegated to dirty chores and mudslide fun. The Year Ahead: Garret Olson should probably stop playing with bears after what happened last time. Wardrobe ETA: Don’t buy this. What Happened to the Player in 2013: Kevin Gregg latched on with the Chicago Cubs (literally, he actually latched) and reestablished himself as a not insane bullpen option, but remained an actual insane person. Strengths: This shirsey seems to come with a bunch of other free stuff. Weaknesses: Might make you want to punch David Ortiz, the most lovable bear in the history of bases, balls, bats, and the like. Realistic Role: High 3; when there’s a possibility that your shirt could punch you, it’s a no-no. The Year Ahead: If Kevin Gregg can continue to get into fights then this shirsey’s ceiling and risk factors will both go up. What Happened to the Player in 2013: Félix Pie played 105 games for the Indianapolis Indians (the Pirate AAA affiliate) last season. He also got 29 at-bats in 27 games with Pittsburgh. He was not on the postseason roster. Strengths: Pie’s last name can easily be misinterpreted as a popular dessert. There is an also an accent on the E in his first name, so it’s pronounced “Fay-leex.” That’s cool. Weaknesses: Pie’s last name is really pronounced “Pee-yay,” so six-year-olds will laugh at you if they know that. Overall Future Potential: 5; owning a Félix Pie shirsey is the best way to reminisce about the Orioles bad old days. Realistic Role: High 4; people who don’t own MLB 2K8 will forget Felix Pie soon enough. Risk Factor/Injury History: There is a small chance Pie could sign on with another Major League team next year, which would hurt this shirsey’s value. The Year Ahead: Pie will probably play professional baseball next year, but only time will tell what country it’s in. eBay Description: “The shirt is two sided (see scans) and comes from a pet-free, smoke-free home. What Happened to the Player in 2013: Rafi was denied access to the Hall of Fame, not because of his steroid use, but because he refused to let security guards search his backpack when he tried to visit with his family. Strengths: It comes from a Smoak-free home. The Tools: 5 derp, 6 awesomeness, 3 player obscurity, 4 potential color scheme, 5 price. What Happened to the Player in 2013: Apparently the group World’s Fair made a song called “Sammy Sosa” earlier this month. Sosa would like to be honored at Wrigley Field sometime in the future. Strengths: Could be mistaken for a Nick Markakis or David Segui Shirsey if someone only sees the front of the shirsey. And if someone see the back of the shirsey, they could think it’s an homage to Chief Keef. Weaknesses: Someone could see the back of the shirsey and realize it’s not an homage to Chief Keef. Overall Future Potential: High 4; the shock factor is really the only thing this shirsey has going for itself. Realistic Role: High 4; nobody’s changing their mind about Sosa any time soon. Risk Factor/Injury History: There are questions about how this shirt was able to become XL after being S at the beginning of its career. We are obviously impartial to any system donning any sort of #CHRISTDAVIS and this super weird one that the Orioles shirsey system boasts is an elite talent. It’s hard to find top-end talent for as cheap as what the vaunted Melvin Mora shirsey is going for, and you have to love the Asian influence on this Top 10. Unfortunately, the two steroid users on this list aren’t exactly are most favorite, but they are still valuable shirseys because dingers. Derpy reliever shirseys are always an exciting commodity to have in your organization; Olson and Gregg provide just that. This is a solid shirsey system with room for improvement because Alexi Casilla shirseys aren’t quite funny enough yet. This entry was posted in #analysis, Shirsey Top 10's.